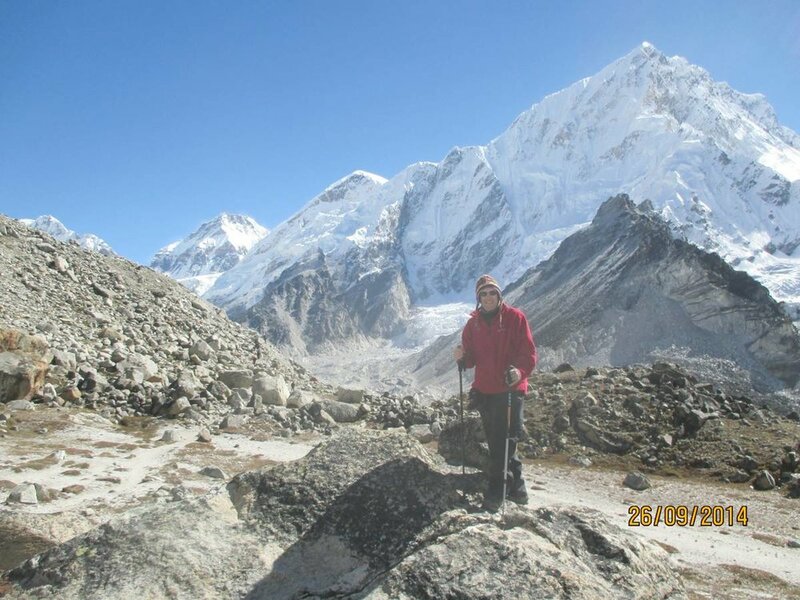 My journey to Everest Base Camp was a very long road. In August 2011 I suddenly became ill with high temperatures. I gradually got worse and worse and after 3 weeks was admitted to hospital and was diagnosed with viral meningitis. Though I was unable to walk more than a few steps, and had lost the capacity to think and speak ‘normally’, I’d been told that lots of people recover from this condition quickly, and so I expected to be back at work and in my usual routine in a few weeks or at worst months. That wasn’t to be my experience! A year later I had been medically discharged from the job that I loved, and was struggling with even the least strenuous of daily tasks. A year beyond that, having been referred to the amazing Brain Injury Team based in Thompson House in Lisburn, I was starting to make progress. However, I was still suffering from chronic fatigue and continued to struggle with word finding and cognitive function. This was two years after I first became ill. Our family were attending Castlewellan Holiday Week, and it was then that I heard about the trek Jono and Beth were leading to Everest Base Camp. I turned to David, my husband, and said, “I’m going to do that, and when I do, I’ll know that I’ve recovered!” I know he didn’t believe me, and I didn’t join the first trip in 2014, but in 2018 I finally reached that goal! It took all of those, almost 7 years, to get to a place where I believed I was ready for this challenge. I wasn’t worried that day by day I was the slowest of the nine members of the team who came together to trek to Base Camp. I had a confidence that somehow, I was going to make it to that destination at 5,335m. The trip and trek itself was amazing with such a mix of experiences! There was the noise, colour and culture of Kathmandu, the flight into Lukla, with a helicopter ride back out, and then the breath-taking scenery trekking through the Himalayas. The trekking company who looked after us were so professional, and the guides with us made sure everyone was safe and well. The accommodation was basic by western standards but, on the whole, much more comfortable than I had expected. It was great to both have company to walk with, but then also to have times when I could walk alone and just allow the beauty of this amazing place to sink in. The few days both before and after reaching Base Camp were the most challenging, but again, I had a real peace and inner confidence that I was going to reach that target. When I finally did reach Base Camp it was incredibly emotional. This was something that meant so much to me, in marking the end of a chapter where a period of illness had seemed to define so much of what life was about for me. Reaching that physical place on a mountain far away, symbolised having overcome another mountain which had been an ever-present barrier in my life for what seemed such a long time. Through this whole journey of recovery I have been very aware of God’s hand at work again and again, in opening doors to my healing, and in teaching me so many lessons along the way. His presence was also incredibly real on this 18 day journey to and from Everest. Alongside a great group of people, led so expertly by Jono, Beth and the team from Mountain Delights, this was a life changing experience for me, and one which I would recommend anyone to consider. 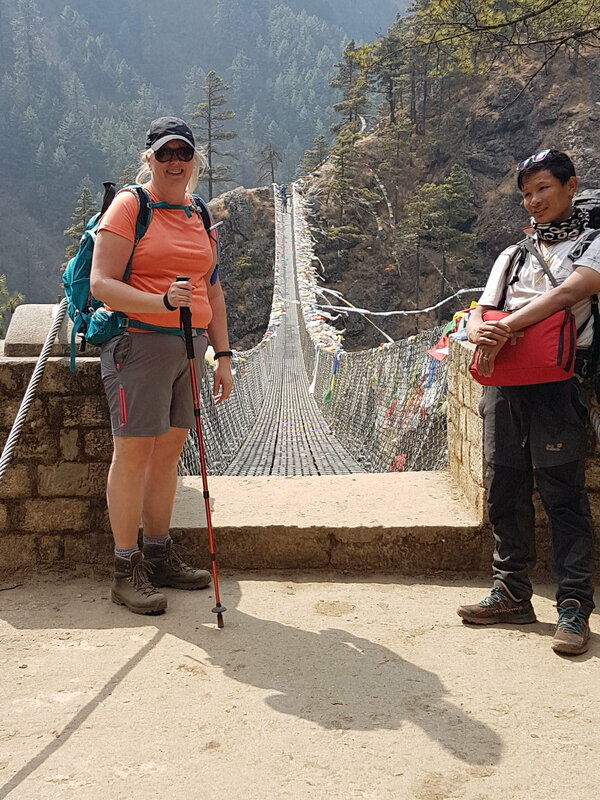 If you'd like more information on the 2019 Treks, please get in touch or you can download the brochure for Base Camp or the Himalayan Trail Trek.